More and more migrants are dying on the sea-crossing from Libya to Italy, making the North African country a pivot in the biggest global refugee crisis since World War Two. How did Libya become a springboard for the EU? There has been no effective government since the 2011 uprising that drove out Col Muammar Gaddafi. Instead, there are hundreds of different armed groups fighting for territory and influence. The groups are divided along ideological and regional lines, and have the support of competing foreign governments - a recipe for civil war. Human trafficking has flowered in this climate. Smugglers, believed to have links to the militias, are making huge profits from packing desperate migrants into unsafe boats bound for Europe. Geography plays a part. Libya's porous land borders connect it to some of the world's poorest and most dangerous countries, and it has a long coastline a few hundred miles from the southern shores of Italy. In November Tripoli's coast guard openly admitted to the BBC that it allowed migrants to set sail, only interfering if a boat runs into trouble - often too late to save lives. 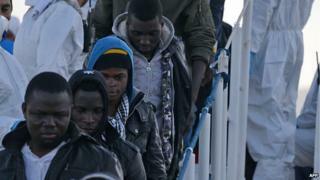 Under Col Gaddafi's authoritarian rule, the flow of migrants was kept in check. But with a patchwork of militias now controlling Libya's ports, there are fewer curbs and no central authority for Europe to deal with. For migrants, Libya's destabilisation has made it the easiest way out of Africa. Until recently, Libya was itself a destination for migrants from Africa and the Middle East, drawn to its relatively robust economy. However, the civil conflict has made it a very dangerous place for any foreigners to linger. Migrants who may once have been prepared to search for work there are now desperate to leave. Libya lies along the migrants' central Mediterranean route, which aims for the shores of Italy and Greece. Others include the Western Mediterranean route, aiming for Spanish territory, and the eastern land route, which goes up through the Balkans. Both the other routes have been targeted by tighter EU controls. Along the Western route, the traffic has decreased. Meanwhile, traffic along the central Mediterranean route - running through Libya - has increased dramatically. Are more migrants favouring this route because the other routes have become harder? Or is the burgeoning trade along this route drawing traffic away from the others? There are no clear answers to these questions. There has been a recent surge in the number of Syrian migrants, fleeing the civil war in their country. The boats from Libya are also carrying Afghans, Somalis and Iraqis - again, fleeing conflict - as well as Eritreans, keen to escape their repressive government. Most of the other migrants are from poor countries in west Africa. They are travelling in search of a better life in the EU. The EU has considered a range of measures to cut migrant deaths at sea, from more aggressive coastal patrols to offshore processing centres. A potential Libyan solution is perhaps the least probable of these. The country has had at least five governments since the 2011 revolution. It currently has two rival governments, one based in the capital, Tripoli, and the other based hundreds of miles away in the port of Tobruk. Militias linked to the rival governments are fighting against each other, as well as against smaller groups, such as the local franchise of Islamic State. As the economy collapses, the profits from the human trafficking trade are likely to prove ever more attractive.